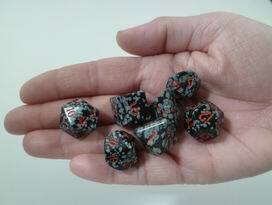 Snowflake Obsidian dice in a full sized set and is certainly one of the most beautiful I've seen! This Snowflake Obsidian set contains seven pieces: one d4, one d6, one d8, one d10, one d10%, one d12 and one d20. The detail and contrast in colors could have only been done by nature!